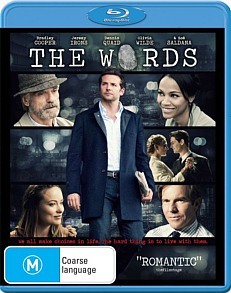 The Words Blu-ray Review It's definitely not your mainstream drama romance thanks to the unique story of a story inside another story. The stars of the film however are Cooper and Irons! The Words is the first directorial feature of Brian Klugman and Lee Sternthal who also wrote the screenplay of this film. 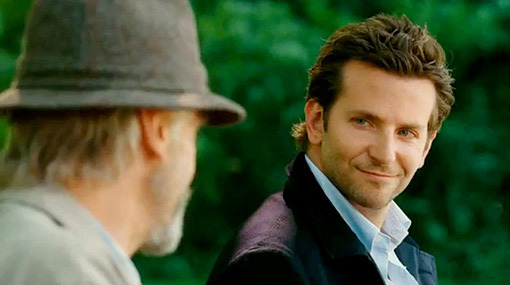 The Words revolves around the life of writer Rory Jansen (Bradley Cooper) who finally hit the jackpot with the release of his latest novel. Unfortunately for Jansen, he has danced with the devil and his novel is actually the work of another man. Just like Pandora and by opening this old briefcase that contained the manuscript for Jansen, it causes a huge ripple through his life and those around him. The briefcase originated from France where Jansen's wife Daniela (Zoe Saldana) brought it for her husband as a gift. As Jansen makes the hard decision to publish this work about a young GI stationed in France during World War II, the original author eventually confronts him about his immoral decision. However the story is not just about Jansen. Rather, the words is broken into three chapters, one revolving Clayton Hammond (Dennis Quaid), a writer who happens to have a beautiful groupie (Olivia Wilde) following him and is the author of the fictional Jansen and finally the story about the soldier (Ben Barnes) from the stolen book. It's almost like Inception with a story inside a story inside another story. Does it work? Sort of. However, where The Words shine is through the engaging writing and realistic characters that you cannot help but follow. Similar to films such as The Notebook or The Time Traveller's Wife, The Words is not set in one era and goes into some details about the soldier from World War II stationed in France. Unfortunately characterisation in the film is a little bit of a mixed bag. Irons and Cooper are brilliant as their perspective characters and you can really get into Rory Jansen's headspace when he chooses success over the love of his wife. Unfortunately Saldana, Quaid and Wilde are sort of lost in the sometimes convoluted plot of a story inside another story. It's also great to see Cooper shed his comedic persona for something more serious and human. At times, there are some clichés and plots that seem a little muddled such as the inclusion of Dennis Quaid's character and his groupie seductress that seems unrealistic when compared to the two other fictional stories. Nonetheless, The Words is an interesting drama romance that creates a unique story about love, consequences and atonement that spans time, fiction and "real-life". It's definitely not your mainstream drama romance thanks to the unique story of a story inside another story. The stars of the film however are Cooper and Irons! On Blu-ray, The Words looks visually impressive with vibrant colours, sharp images and flawless video quality. Audio is equally as good thanks to the 5.1 DTS-HD soundtrack with great levels and clear dialogue. The soundtrack of the film also suits the premise perfectly. For special features, there are cast interviews by those involved which does shed some insight into the movie and more particularly the story of The Words.